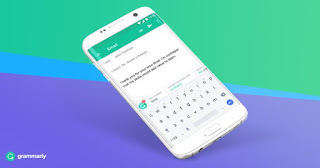 The popular Grammarly website has just released an Android keyboard app called Grammarly; to help you make your grammars more better. Grammarly does not offer just spell check, the tool is beyond that. It looks for grammatical errors, words suggestions and many more. Though, there are some features missing in the keyboard app as it's still new. Hopefully, more features would be added in subsequent updates from the developers. The keyboard will so much help you with your grammars and make it more better. Grammarly keyboard is very easy to setup, just like how you set up other Android keyboard apps. You just have to download/install the keyboard app, enable it and set it as default like you would do to any other keyboard app. It looks similar to the Google Keyboard, but correction bubbles pop up at the top as you type. You can tap to accept the suggestion or tap the Grammarly button to see the errors expanded with explanations for the proposed change. It's not unlike Grammarly on the desktop version. You can also login with your premium details if you are a premium user so you can get more advanced features from the keyboard app. For free users, you will get just the basic features but it isn't as powerful, but it's still more better than a regular spell checker keyboard. The Grammarly keyboard is not that cool in terms of UI. There are no themes, swipe input, or layout options. Still, it will surely help you with your grammars. WHERE TO DOWNLOAD GRAMMARLY KEYBOARD APP? The app is already available on Google Playstore - Download Here. This is a good app,am gonna download mine later. Innovative, I like such creative ideas.